Pepper berries that are the same as the black peppercorn, except that they have been ripened longer and then soaked in a water solution before removing the black outer hull. Referred to as "poivre blanc" by the French, the White Peppercorn is ground to produce white pepper which is commonly used in foods that are heated to high temperatures, since this variety of pepper can withstand higher temperatures than black pepper. With a sharper flavor than the black peppercorn, white pepper is used as an alternative to black pepper in recipes such as grilled meats, and white sauces or white mashed potatoes when a more pleasing appearance is desired, eliminating the black specks in the food. White peppercorns have a unique aroma that is not only hot, but slightly musky. They are the preferred pepper in much of the world. It goes well in sauces, light colored meats, and soups. Substitutes: • black pepper is the best substitute, But the differences between the two in both smell and taste are quite distinctive. Choosing: The plant, pepper nigrum, is propagated in Brazil, India, Indonesia, and Malaysia. To reach the white pepper stage, berries are allowed to ripen and then soaked in water to remove the hulls. Black pepper, on the other hand, is harvested before the berries are ripe. Buying: Whole peppercorns are always preferred over ground or cracked. • The main reason most cooks use white pepper is to maintain consistent color in light foods. Black specks in a perfectly prepared creamy white sauce are considered distracting. • Add to other “white” foods such as mashed potatoes or gravies. 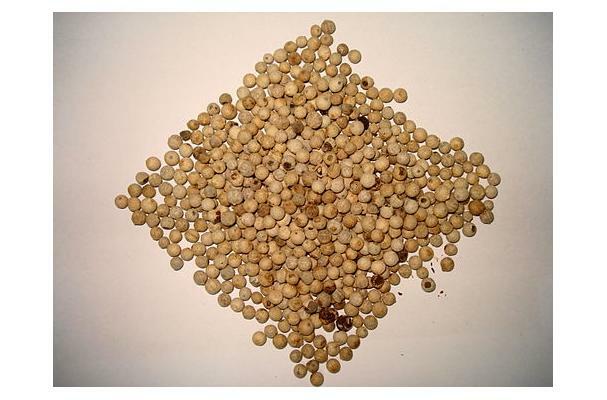 • White pepper can also be used in marinades or added to pickling spice. Cleaning: No need to wash or rinse. • Fresh peppercorns can be kept for 1-2 years in a cool, dark spot. Grind as needed. • Cracked and ground white pepper will retain top quality for about 4-6 months. European cooks particularly favor white pepper for soups and sauces and prefer it as a table condiment.